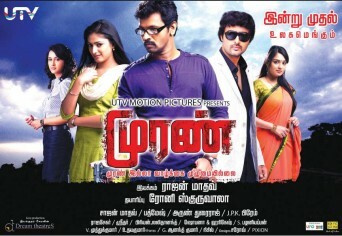 Muran stars Cheran,Prasanna,Hari Priya,Nikitha,and Suma B.,Neelima Rani in the lead roles. Its directed and written by debutant Rajjan Madhav.Music is by Sajjan Madhav and cinematography by Padmesh; and editing is by Arun Durairaj. Story: Nanda's(Cheran) car gets stuck on the road after a conflict with these random people. So Nanda needs a lift, here comes Arjun(Prasanna). Arjun gives Nanda a lift and as the ride goes on; both of them share their stories. After a bit, Prasanna drops the "bomb", except the unexpected. Performances: Prasanna is back with a bang! His role is on the lines of Anjanthe but not that cruel. He has lost alot of weight and looks super cool, kudos to the stylist. Cheran,its hard to answer: Is he a better director or an actor? He does both, so well. Hari Priya, this is my first movie of hers I have seen,an she's a pretty good actress, but the voice didn't suit her character. Nikitha was a surprise, she has kind of disappeared all these years,and shes back; her acting isn't bad either. Suma B. is another surprise, she needs to work on her acting skills. Jayaprakash is also good in what he has. Neelima Rani is always awesome,no matter what film. Direction:Muran is directed by debutante Rajjan Madhav, and he truly seems promising from his first film. Though the film is based on Strangers on a Train, Rajjan seems to have his own style. He doesn't waste time in doing un-needed scenes. He's definitely a director to watch out for. Cinematography and Editing: Camera work by Padmesh plays a big role in the thrill factor of this film. Especially towards the end and in the beginning.Arun Durairaj the editor does a clean job in the editing section. Music: Sajjan Madhav is the brother of Rajjan,the director,handles the music.Music is not bad at all, goes along with the story. All you Tamil movie buffs, WATCH IT WATCH IT WATCH IT GOOOOO. You really don't want to miss it! Once Again, when you go, Expect the Unexpected. The story revolves around two contrasting characters and depicts the incidents that occur when they meet each other. Cheran acted lead role in this film.Prasanna acted Villain character.